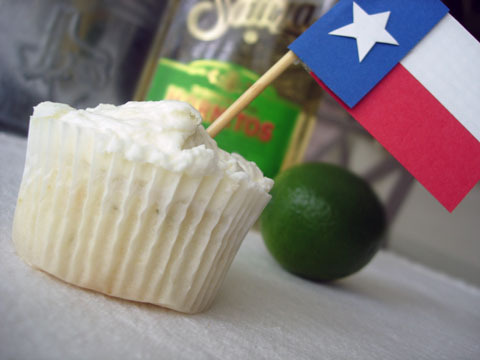 It seemed only fitting to whip up a home-brew batch of margarita cupcakes to complement a bridal shower we held at one of the best Tex-Mex restaurants in Houston. El Tiempo on Washington Ave, in my opinion, serves the very best margaritas and chicken fajitas in the city – and y’all, this is a big city! A search on Google yielded very few recipes and none that completely peaked my interest (ie, included booze) or taste buds – you know what that means: Let the experiments begin! My husband makes a fabulous margarita (aka “The Unofficial State Drink of Texas”). You know the ol’ Lush-In-Training motto: You can’t drink just one 🙂 That inspiration, along with a shell of a recipe from Wilton proved to be the winning combination as the cupcakes turned out far better than I could have hoped for – a fabulous cupcake to honor a fabulous friend! I decorated boxes from a local craft store in lime green and fuschia and used those to transport the individual cupcakes from the Tapas party at my house to the restaurant. I think I temporarily gave myself arthritis from using that flower-shaped scrapbooking punchy thingy. No matter – the boxes looked great! And apparently, tequila cures arthritis. *Update* Click here for the from-scratch version that does not use a box mix. It’s much better. The frosting is to-die for. And only takes a few extra minutes! A fun cocktail-turned-dessert for a Cinco de Mayo party! Preheat oven to 350. Line two cupcake pans with paper liners. Mix the cake mix, egg whites, vegetable oil, lime zest and the reserved margarita mix. Blend on low for about 30 seconds and then increase speed to medium and blend for two additional minutes (follow the directions on your box mix if they vary greatly). Batter might be slightly lumpy. Fill cupcake liners about 3/4 full, baking for 20-25 min, or until toothpick inserted in center comes out clean. Let cupcakes cool for about 10 minutes in the pans, and then remove and cool completely. Beat butter in a large bowl until fluffy, 2-3 minutes. Add ~5 cups powdered sugar, salt, lime juice, and lime zest. Mix until thick and creamy. Add more powdered sugar if necessary to get a nice spreadable/pipeable frosting. Add a bit of green food coloring or gel paste, if desired. Frost cupcakes with a spatula or piping bag fitted with a tip. Garnish with lime slices, if desired. OK. That is so cool. The cupcake looks like it is floating in mid-air. Thanks for stopping by my blog; now I’ve found yours. Those look cute but so grown up thanks to the margarita connection…Yum! I already dig the frosting…Can I have a bowl of it please?! Wow, Shawnda, your blog looks so beautiful!!! I saw Margarita Cupcakes for the first time over at the Baking Sheet blog. I bookmarked them to try then, but now I think I must try this sooner than later! Yours look incredible! Margarita cupcakes??? That sounds fantastic. Ain’t nothin better than something with tequila in it. Very cool. TexanNewYorker – I’ll trade your sister a lifetime supply of those for her metabolism. Chris – Thanks! You could use a batch of green cupcakes to sugar-fuel all your work over the next couple weeks, eh? Those are so cute! I want 3. Now this has definitely caught ny attention. Maragitas are one of my favourite drinks!! This is going on my list of things to try!! I’m sure it made for a great bridal shower. Thanks! These are great looking cupcakes. I can see them in my future. Do they have a strong margarita taste? Do you think they would be ok to take to work?? I am thinking a St. Patty’s day treat would be nice. JenJen – Definitely give ’em a try! Heather – They did not have an intense boozy taste or smell after cooking. I *could* smell the tequila in the batter but the 3 shots are spread out across approximately 18 cupcakes (more if I would have stopped tasting it). I personally don’t think there would be a problem in bringing ’em to the office! I love your food snob section! Also, these cupcakes look terrific. I love your margarita cupcakes! Everyone loved them so much the first 2 times I made them, I’m making them by request this evening. I tried this recipe this weekend and they turned out amazing!!! I found your site while I was looking around for a pink lemonade cupcake recipe and then couldn’t resist the margarita version once I saw it! I love your site! Wow, what a cool recipe. These sound so tasty and fun as well. Can’t wait to try this out. These are DELICIOUS!! Instead of using 3 tb of lime juice, I squeezed a fresh lime in and added the remainder of the margarita mixture. I made them last night for a Taco Night party and they were a hit! @Debbie, Darn, what is that 3 this week? Can I hire you to look at all my older stuff 🙂 Thanks for letting me know, it gave me the excuse to fix the formatting and a couple of clunky steps. “Professional recipe developer?” Shame, shame.